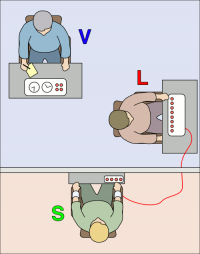 An illustration of the Milgram experiment. The infamous Milgram experiments in 1960 were loosely based on the experiments in conformity of Stanley Milgram’s mentor, Professor Solomon Asch. Since that time, similar experiments have been performed, and largely validated again and again: most recently in 2005 at Eindhoven University of Technology (this time using a robot instead of a victim); in 2007 at Santa Clara University (virtually no change in compliance with Milgram’s results were found), and in June of this year (finding that “nice” and “agreeable” people are most likely to torture strangers when told to do so by a figure of authority). So we know that Milgram was on to something, and it’s quite clear—horrifically clear—what. But in a new article in Aeon Magazine, writer Malcolm Harris asks a question that we don’t know the answer to: why do we keep repeating these experiments in torture and conformity? If, after all, we know what the principle involved is, and that the results are sound, why does researcher after researcher, team after team, continue to see if—this time—people will be any more resistant to an authority figure? Harris’ intriguing answer is that social science as we know it today isn’t just a science in the ordinary sense: it’s a discipline of research with a clear origin in a specific trauma, one that shook the world and is unanswerable to the modern mind. Harris sees this is Freudian terms: we are reliving a traumatic event in our past, hoping to master and take control of what is already done. Perhaps—but I think another answer compliments that idea. Perhaps the greatest trauma in human history occurred in a western culture that was rapidly losing its sense of the tragic. Even as the gas chambers churned, the zeitgeist of the west was turning into one in which rational thought and hard work could triumph over all ills. You just need the right system, the right plan, the right product, the right lifestyle … and there is nothing that cannot be overcome. Existentialism itself arguably developed precisely because the idea that life is tragic was no longer obvious enough not to warrant comment. We needed to be reminded. From this perspective, we repeat the Milgram experiments because, as a culture that has lost its sense of the tragic, we just can’t believe on a fundamental level that these results are true—or leave them alone. In that sense, Harris suggests, the Milgram experiments might best be viewed not as science—though I’d argue that they clearly are empirically correct, which Harris would not—but as a work of art, providing knowledge that cannot be stored away in the footnotes of a reference text as an eternal truth but that must be relearned, over and over again, by everyone who approaches life’s tragic elements.